Wooo! I am beyond excited for the return of the Corvette Stingray! When I was young, our neighbor had a candy apple red, 76 Corvette Stingray and I fell in love. The vette’ has always held a special place in my heart, but the Stingray, well, the Stingray is my Mona Lisa. Isn’t she lovely. 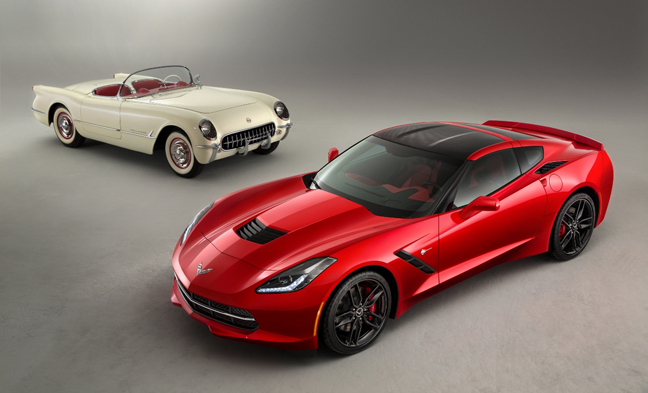 The 2014 Corvette Stingray is the most powerful standard model ever. This bad lady posses an estimated 460 horsepower and 450 lb.-ft. of torque. She can scorch the road too, going from 0-60 in 3.8 seconds and achieve more than 1g in cornering grip. Oh and she doesn’t sip too much gas either, the most fuel efficient Corvette ever getting an EPA-estimated 29 MPG. Needless to say again, I am excited. Now, I am on a mission to come up with $62,000 to get the Z51 version. If you would like to learn more about the new Stingray, check out this great video here. You can go on a biometric test drive. It’s a lot of fun! This entry was posted in Auto Performance, Automotive Innovations, Automotive News, Car Talk by MACK HANSON. Bookmark the permalink.